« Girls Just Wanna Have Fu-un! -Good cloth cutting scissors. 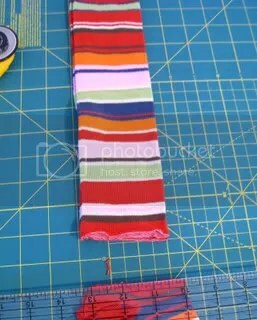 I have my trusty Ginghers here and I love them (they are quite expensive $20-$50) so any scissors that will cut through multiple layers of fabric will do great. -Thread (it’s nice to have coordinating thread but if not that is cool too). 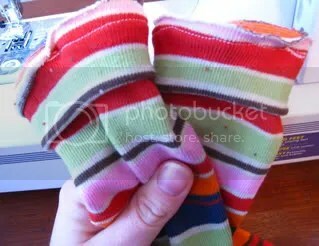 -Lay both socks together and as even as you can get down on your mat, or table if you are cutting by hand. -Going down as far as you can before the heels cut straight across. 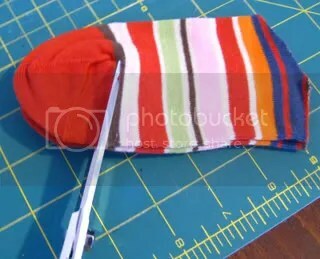 You are cutting of the entire foot portion of the sock. 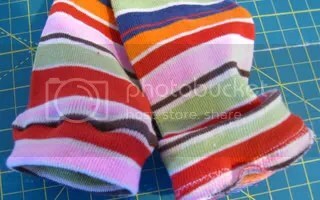 -Cut off the toes and heels of both socks at once to make 2 tubes. They will become your cuffs. I like to go directly around the toes and heels and then straighten my cut, this way I can salvage as much as possible. -Now even up the tubes still working with both socks together. 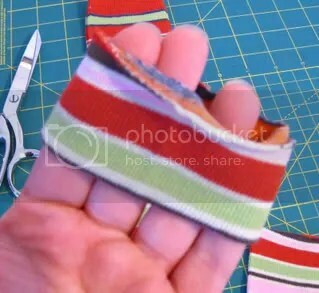 By cutting both at the same time you are ensuring that both warmers will be identical in size. 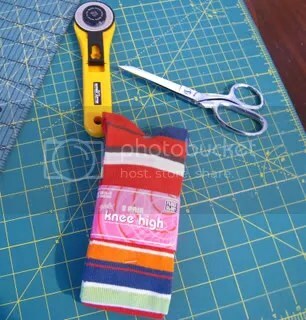 -Now using your scissors or cutter trim up the upper portion of the sock to be as straight and even as you can. -Here are the trimmed and ready to pin tube and body. -Now you will take one tube and fold it in half so that the right side is outside. 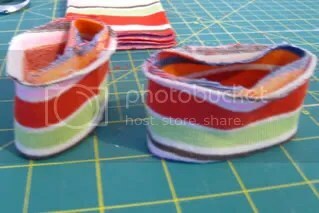 If there is a pattern you want to show on the finished product make sure it is front and center when folded. Do this to both tubes. -Both tubes are folded into cuffs. 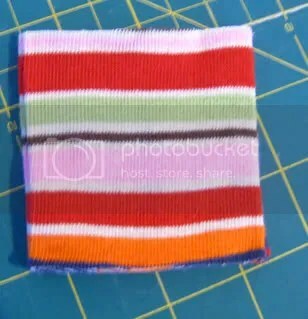 -With the finished edge of the cuff facing away from your arm pull the main body of sock inside the cuff so that the raw edges come together. So both finished edges will be going upwards and the raw edges at the bottom. *I find it easiest to only pull one side in at a time. 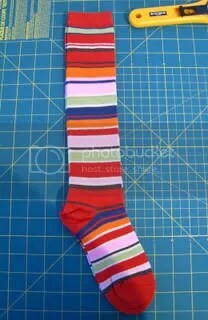 I also find the natural fold in the sock and match it up with the fold in the cuff. 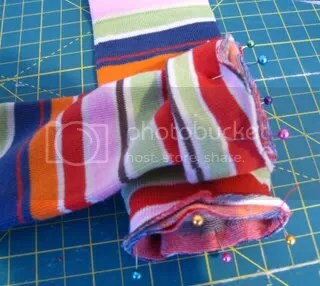 -I begin to pin the cuff to the sock. You can see the natural fold in the photo and that is what I use to pin. I use 4 pins for each warmer. Two pins where the natural fold is and two others in between. This way you know that the space is evenly distributed around the circle. I pin one side at a time and then stretch in between the two pins and pin again. -Both cuffs are pinned and ready to sew! -Using the middle needle position (1) and my regular old joe presser foot (J for a Brother machine) I lay the warmer down with the cuff portion facing up. 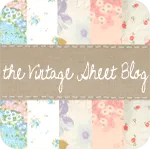 -I use a stitch length of 3.5 on the straight stitch. 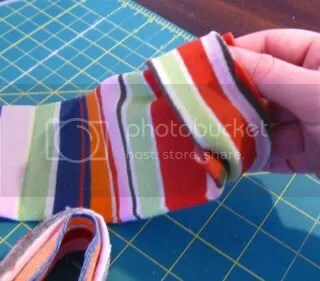 It helps to feed the fabric along easier than a shorter stitch length. 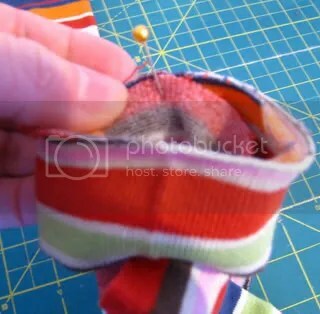 -*You can take the pins out as you sew or leave them in and sew over them, I do the latter and remove them after I am done going all the way around. -Both seams are done. 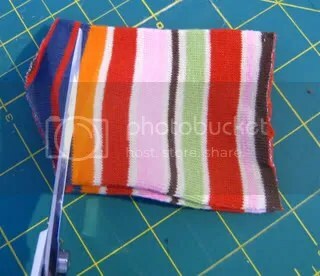 I like to go right below the seam line and zig zag using a 2.5 stitch length and 3.5 stitch width. 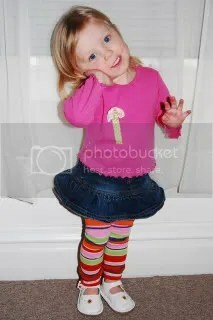 i’ve been meaning to make some legwarmers for my toddler for ages, first i tryed knitting some but he was too interested in the knitting & it got messed up. 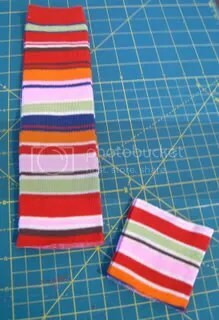 Now i’ve been meaning to cut up some socks for a while but i hadn’t thought of doing cuffs, they look lovely like that. thanks for the idea.